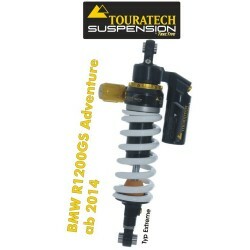 The Touratech Suspension Extreme shock absorber. The name says it all. With the "Extreme", the suspension is not automatically and continuously adjusted. The required settings are made by hand, and the motorcycle is balanced according to the load. The hydraulic position-dependent damping system (PDS) ensures that the the spring elements will not bottom out even with heavy luggage in the most extreme off-road conditions. The "Extreme" suspension system from Touratech Suspension for the BMW R1200GS Adventure enhances stability and comfort even over thousands of miles on the harshest off-road terrain, ensuring greater safety and riding enjoyment.